You mostly monitor on near-fields, but occasionally switch to big main speakers or a second set of near-fields. You need to be able to switch between multiple sources and want to hear what your mix sounds like with and without subwoofer. You want to monitor straight from digital sources as well as analog. And you don’t want cables cluttering your workspace in order to achieve all that. Meet the Central Station PLUS. 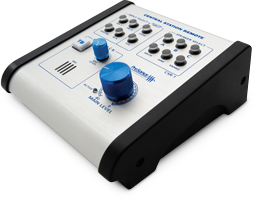 Central Station PLUS is one of our most popular products for professional studios because it provides the perfect combination of stereo inputs, outputs, and recording-communication functions, allowing you to easily manage multiple sources and monitor speakers. With Central Station, you can easily switch between three sets of stereo, analog input sources. Two stereo S/PDIF digital sources connect via one coax and one Toslink optical port. You can audition these sources with up to three pairs of speakers, with individual trim pots for each speaker—recessed to avoid accidents. You also get a pair of line-level main outputs, a pair of line-level cue outputs, and two screaming-loud headphone amplifiers with individual level controls. And because Central Station is a 1U rack-mount device, with only one multi-conductor cable running to the remote control on your desktop, all of the cabling is in the back of your rack, where it belongs. The pros know that for critical listening, a monitor-control system must be as sonically transparent as possible. That’s why we gave the Central Station an audiophile-quality, passive signal path, with no op-amps or ICs, and equipped the S/PDIF inputs with high-definition, 24-bit, 192 kHz D/A converters. Being from southeast Louisiana, we’re big fans of The Meters (Art Neville, Leo Nocentelli, George Porter, Jr., and Joseph Modeliste). Being audio professionals, we’re into extremely accurate metering. To enable you to watch your input levels, the Central Station sports dual 30-segment, tri-colored, fast-acting, peak-hold LED meters, which can display dBu and dBfs. A handy Clear switch lets you clear the peak-hold. Unlike The Meters, these meters are anything but funky! Because Central Station PLUS is a professional tool, we’ve included all of the key features you’ll need to manage monitors in a commercial or project studio. Speak to the musicians over the headphone and cue buses using the onboard talkback microphone or connect a dynamic mic to the XLR talkback input. The cue signal is automatically dimmed when you use the talkback mic, and a jack admits a footswitch for hands-free talkback operation. A Mono switch sums the stereo source so you can check for phase problems, and a Dim switch lets you reduce the speaker output by 16 dB. Of course, you can mute the speakers as well. Finally, with the included CSR-1, you can remote-control the Central Station’s main volume, input select, output select, talkback, mute, dim, and mono functions. With pristine audio quality; the ability to switch between multiple analog and digital sources and three sets of speakers; fast, accurate metering; and all of the extras that make your studio work easier and more efficient, it’s obvious why the Central Station PLUS is the professional engineer’s choice for monitor control.